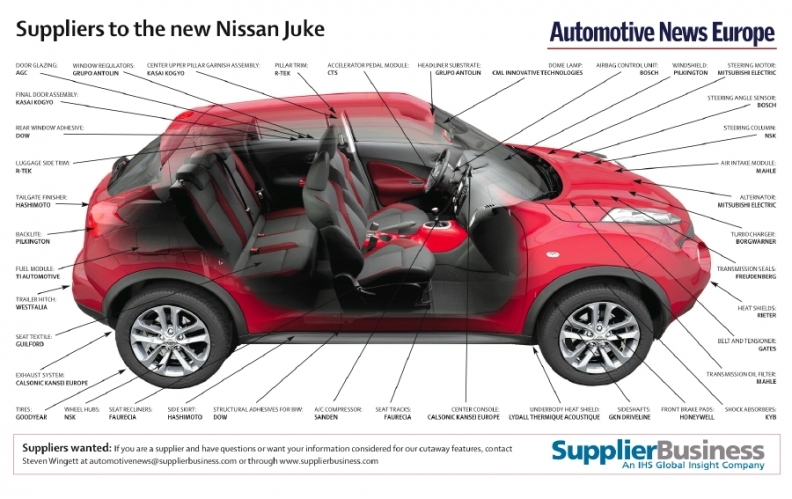 The new Nissan Juke's center console was developed and is supplied by Calsonic Kansei Corp. The system displays key driving metrics on a thin-film transistor (TFT) screen and enables the driver to change ride settings as well as adjust other functions, such as the climate control system. Calsonic Kansei's other significant contributions include the heating ventilation and air conditioning (HVAC) system, exhaust system, condenser, compressor and body control module. Calsonic Kansei became a consolidated subsidiary of Nissan in 2005. Japan's Hashimoto Ltd. won its first Nissan UK business via Calsonic Kansei. Hashimoto supplies the Juke's painted console structures, which are either red or grey and resemble a motorcycle fuel tank. JTEKT Corp. provides the Juke's optional four-wheel-drive system, which improves stability using torque-vectoring to distribute torque side-to-side during cornering. The Juke is the smallest of Nissan's trio of crossovers that includes the compact Qashqai and larger Murano. The Juke debuted at the 2010 Geneva auto show. It was developed from the Qazana concept car and is based on the Renault-Nissan alliance's B platform. Renault owns a controlling stake in Nissan. In Europe, the Juke comes with three engine options – one diesel and two 1.6-liter gasoline units.